Cinder block walls are practical and budget friendly, but they’re not always the most attractive option nor are they particularly weathertight when left unfinished. Covering a cinder block wall helps it fit the aesthetic of the surrounding buildings and improves its durability. There are several ways to approach the job, depending on the look you prefer. Before you apply any type of cover, however, clean the wall and repair any damage. 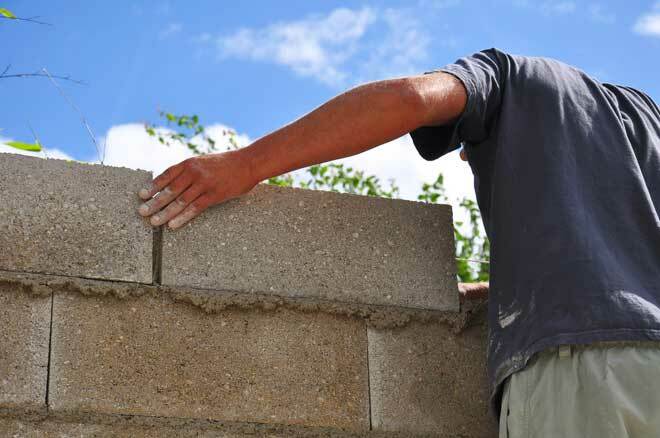 The simplest way to cover a cinder block wall is by using surface bonding cement to create a concrete finish. Concrete helps insulate the building and keep moisture out. It creates a smooth, finished surface you can leave as is or paint. If you want a colored wall, but don’t want to paint, concrete pigment is the way to go. Concrete also gives you the freedom to create any texture you want, such as polished, broom brushed, or sponge finished. 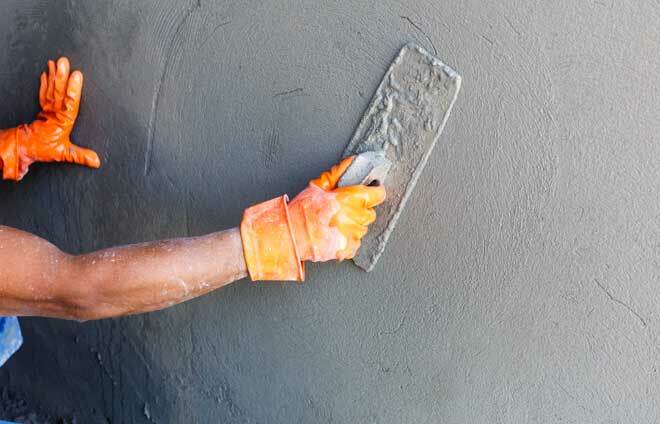 Surface bonding cement contains acrylic and fiberglass to make it easier to apply to vertical surfaces, so it’s a practical choice if you’re not used to working with concrete. To apply this cement, first prepare the concrete mixture. Thoroughly wet the whole cinder block wall, then re-wet a 3 to 6 sq. ft. section of wall. The wall must be wet to allow the mixture to adhere properly. Use a trowel or paint brush to apply a 1/4-inch layer of mixture as evenly as you can to the small section you re-wet. Re-wet another section and continue working with one section of the wall at a time until it’s all covered. Renting a concrete sprayer will help you get the job done faster. Stucco provides a classic, uncomplicated finish that’s more decorative than concrete and that works particularly well for southwestern-style homes. Because stucco is made from a mixture of cement, lime, and silica, it offers many of the same benefits as concrete. As with concrete, you’ll have the option of using concrete pigment or painting the wall your preferred color. To apply stucco, you’ll need a hawk, a flat tray with a handle in the middle. 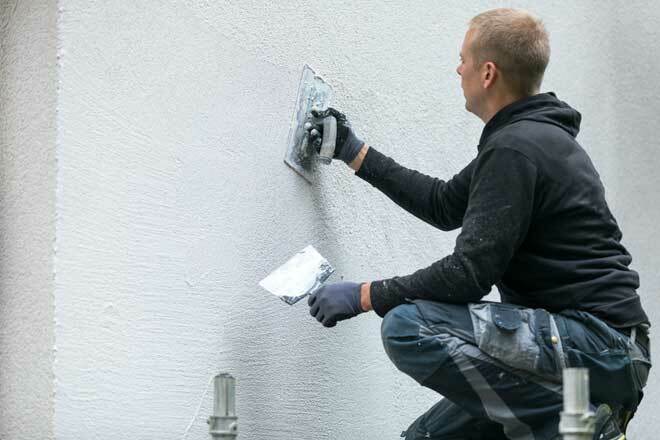 The specific application process for stucco mixture can vary by manufacturer, but for most, you’ll first need to apply a bonding agent with a paintbrush or sprayer and let this dry overnight. You’ll then apply an initial coat called a scratch coat, which takes several days to dry and must be misted regularly as it dries. To finish the job, you’ll apply the final coat in which you can create designs such as swirls and waves. If your home features vinyl siding, adding siding to the exterior cinder block walls of your outbuildings will give your property a more cohesive look. Siding comes in a wide range of colors and textures, including those that mimic wood and stone, so it’s easy to get the look you want. To install vinyl siding on a cinder block wall, you’ll first need to install furring strips on the wall by nailing or screwing the strips into the joints between the blocks. 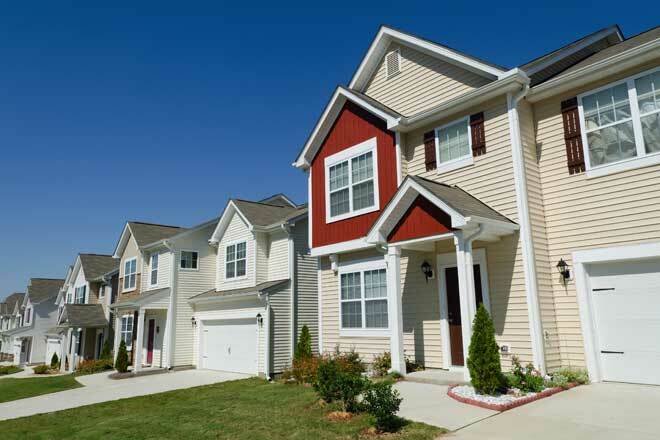 Furring strips are thin lengths of wood used to create space between the wall and the siding. You can then install the vinyl trim followed by the siding itself onto the furring strips. The timeless elegance of a stone wall fits nearly any landscape. Stone wall veneer lets you turn your drab cinder block wall into a landscape feature that brings a little touch of luxury along with it. These veneers look just like real stone and are available in a variety of styles, including slate, ledgestone, fieldstone, and river rock. The exact method of installation depends on the style you choose, but in general, you’ll only need to apply mortar to the sections of veneer and press them directly onto the wall. To ensure you get the look you want, lay the sections of veneer out on the ground in the pattern you have planned for the wall. Some veneers, such as imitation fieldstone, also require grouting after installation. 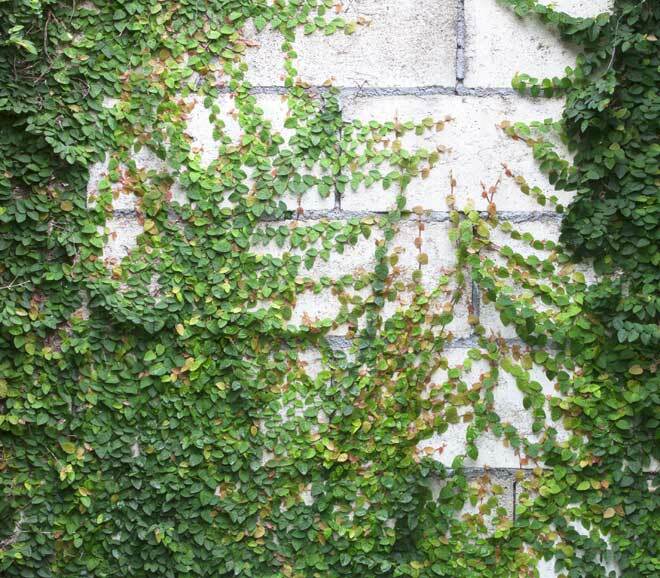 If you’d prefer a natural look for your wall, climbing plants are a beautiful and easy way to achieve it. To help the plants spread out over the wall, attach a lattice to it using concrete screws. You can make your own lattice with narrow slats of wood or, for a more rustic look, tree branches bound together with wire or twine. Place spacers between the wall and the lattice to give the plants room to wrap around the lattice. When you choose your plants, keep your climate and the plant’s weight in mind. A heavy plant, such as wisteria, can easily tear down a lightweight lattice or even a whole wall. Ivy, clematis, cup and saucer (Cobaea scandens), and sweet pea (Lathyrus odoratus) are generally safe choices. If you’re tired of looking at that plain cinder block wall on your property, you have plenty of options for giving it a facelift. For a quick and simple cover up, try concrete or stucco. 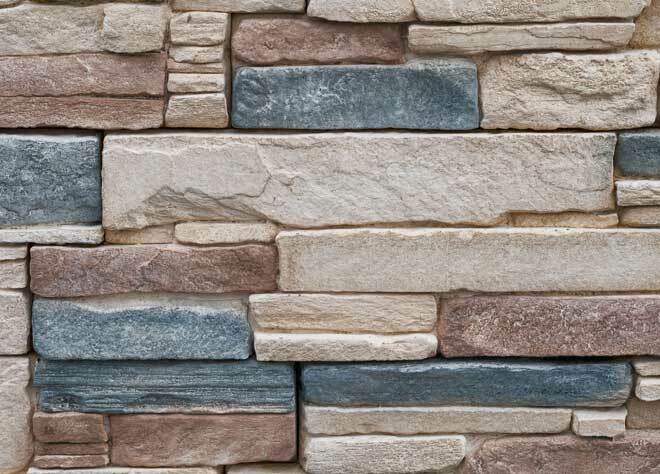 To give the wall a a more unique character, consider stone wall veneer or climbing plants.